Islam is the religion of a majority of the Cham (also called Khmer Islam) and Malay minorities in Cambodia. According to Po Dharma, there were 150,000 to 200,000 Muslims in Cambodia as late as 1975. Persecution under the Khmer Rouge eroded their numbers, however, and by the late 1980s they probably had not regained their former strength. In 2009, the Pew Research Center estimated that 1.6% of the population, or 236,000 people were Muslims. All of the Cham Muslims are Sunnis of the Shafi'i school. There is also a growing Ahmadiyya Muslim Community in Cambodia. Po Dharma divides the Muslim Cham in Cambodia into a traditionalist branch and an orthodox branch. The Cham have their own mosques. In 1962 there were about 100 mosques in the country. At the end of the nineteenth century, the Muslims in Cambodia formed a unified community under the authority of four religious dignitaries—mupti, tuk kalih, raja kalik, and tvan pake. A council of notables in Cham villages consisted of one hakem and several katip, bilal, and labi. The four high dignitaries and the hakem were exempt from personal taxes, and they were invited to take part in major national ceremonies at the royal court. When Cambodia became independent, the Islamic community was placed under the control of a five-member council that represented the community in official functions and in contacts with other Islamic communities. Each Muslim community has a hakem who leads the community and the mosque, an imam who leads the prayers, and a bilal who calls the faithful to the daily prayers. The peninsula of Chrouy Changvar near Phnom Penh is considered the spiritual center of the Cham, and several high Muslim officials reside there. Each year some of the Cham go to study the Qur'an at Kelantan in Malaysia, and some go on to study in, or make a pilgrimage to, Mecca. According to figures from the late 1950s, about 7 percent of the Cham had completed the pilgrimage and could wear the fez or turban as a sign of their accomplishment. The traditional Cham retain many ancient Muslim or pre-Muslim traditions and rites. They consider Allah as the all-powerful God, but they also recognize other non-Islamic practices. They are closer, in many respects, to the Cham of coastal Vietnam than they are to other Muslims. The religious dignitaries of the traditional Cham (and of the Cham in Vietnam) dress completely in white, and they shave their heads and faces. These Cham believe in the power of magic and sorcery, and they attach great importance to magical practices in order to avoid sickness or slow or violent death. They believe in many supernatural powers. Although they show little interest in the pilgrimage to Mecca and in the five daily prayers, the traditional Cham do celebrate many Muslim festivals and rituals. The orthodox Cham have adopted a more conformist religion largely because of their close contacts with, and intermarriages with, the Malay community. 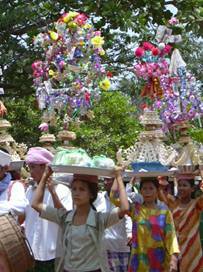 In fact, the orthodox Cham have adopted Malay customs and family organization, and many speak the Malay language. They send pilgrims to Mecca, and they attend international Islamic conferences. Conflicts between the traditional and the orthodox Cham increased between 1954 and 1975. For example, the two groups polarized the population of one village, and each group eventually had its own mosque and separate religious organization. According to Cham sources, 132 mosques were destroyed during the Khmer Rouge era, many others were desecrated, and Muslims were not allowed to worship. Later, since the Vietnamese-installed PRK regime, Islam has been given the same freedom as Buddhism. Vickery believes that about 185,000 Cham lived in Cambodia in the mid-1980s and that the number of mosques was about the same then as it was before 1975. In early 1988, there were six mosques in the Phnom Penh area and a "good number" in the provinces, but Muslim dignitaries were thinly stretched; only 20 of the previous 113 most prominent Cham clergy in Cambodia survived the Khmer Rouge period. Cambodia’s Muslim community (the Cham) faces many problems, including poverty, relative isolation (outside the capital of Phnom Penh, most Muslims live in communities that lack access to such basic infrastructure as good roads, water, electricity, telecommunications, and newspapers), and negative cultural perceptions (some members of the majority Buddhist community and minority ethnic groups still view the Cham with suspicion, if not superstition). In 2005, the Cambodia Television Network aired a program, “Manpower and Destiny,” that for the first time featured a Cham as a lead character. However, the series depicted the Muslim as an indolent who depended on destiny rather than his own efforts. In addition, the actor portraying the Cham character wears an earring (which Muslim men are not allowed to do) and clothing that is supposed to be worn for praying and religious ceremonies only. He also drinks beer. An outcry from the Cham community contributed to the series being taken off the air. Muslim women have traditionally faced a number of social and cultural obstacles to their development, including fewer opportunities for advancement than either the general population or Muslim men. These translate into Cham women enjoying less access to adequate health care, having lower status in society in terms of both family and community decision making, lacking a voice in the political arena, and lower educational attainment. This paper focuses on the last area – education, which affects all the other problems women experience. It also offers some solutions to improve their situation. “My Lord! 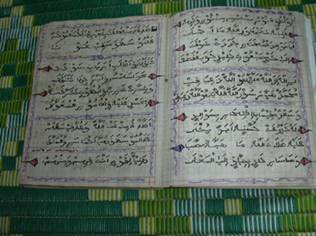 Enrich me with knowledge.” Surah TA HA, 20:114. 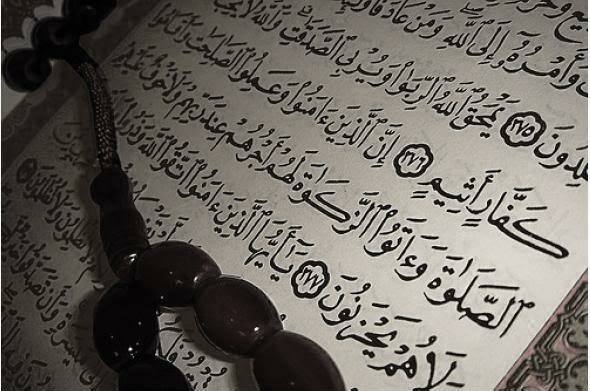 For Muslims, the Qur-An is the final word of Allah as revealed through his last messenger Muhammad. This holy book contains guidance from Allah, not only on how to find salvation but also on how people should live their lives in the right way. The Qur-An begins with an important word: “Read.” It states that “The best form of worship is the pursuit of knowledge,” and also that “The ink of the scholar’s pen is more sacred than the blood of the martyrs.” The Qur-An tells us that without education, it is difficult for people to understand its teachings, and that education is vital for all aspects of our lives. However, while the Qur-An says that both men and women should pursue knowledge, it also places restrictions on women’s interactions with the outside world (such as placing them under the protection of their parents), and proscribes different rights for men and women owing to their psychological and biological differences. This has limited women’s ability to obtain modern academic educations, which has in turn impeded their ability to become knowledgeable about the wider world and to make intellectual and economic contributions to their families and communities. One out of every five people in the world today is Muslim. Yet only about 38% of Muslims are literate. For women, the picture is even worse: in many rural areas of the Islamic world, only about 5 out of every 100 women can read and write. According to the United Nations Development Programme, Muslim women also have the lowest economic and political participation of any group of women in the world. Many scholars have linked the lack of education to the lack of economic opportunities and development that are now plaguing many Muslim countries. So, low levels of literacy are at least partly responsible for the poverty in which many Muslims live today. It is likely that people who lack modern education will fall further and further behind and become mired in their poverty. The world is changing fast, and how we live our lives and the ways in which we earn a living play a very important part in our future. Without strong human resources and capital, it will be difficult for Muslims to advance. To use these human resources wisely and to keep up with the rest of the world, Muslims need education, including such broad studies as science, mathematics, economics, and of course, advanced technology. Without a doubt, women represent half of the Muslim world’s human resources, and can play an indispensable part in development. They should not be confined to the kitchen. Rather, they should be encouraged to pursue their studies, have careers that make a contribution to their society, and be empowered in decision making processes. About 90% of Cambodia’s 13.6 million people are Khmers, who practice Buddhism. The other 10% comprise a variety of ethnic and religious groups, including Vietnamese, Chinese, highland minorities, and Chams. The Chams are a diverse group; most of them descend from the Kingdom of Champa and Malays (primarily of Javanese extraction). The Kingdom of Champa controlled what is now south and central Vietnam from the 2nd through the 17th centuries; its peoples converted from Hinduism to Islam in the 15th century. The Champa Kingdom’s defeat at the hands of the Vietnamese in the 15th and 18th centuries forced the Champa king and many of his followers to flee to Cambodia, where most Cham live today. The Malay influence on Chams is felt through their language, which is based on Arabic and is akin to Bahasa Malaysia and Bahasa Indonesia. - There is a small traditionalist branch (about 35 villages) which retains many ancient Muslim and pre-Muslim rites and traditions (e.g., from Buddhism and Hinduism), and takes a more liberal interpretation of Islam. This community’s attitudes toward women are also more liberal; for example, few women cover their heads outside the area of the mosque. - The far larger orthodox Cham community takes a more conservative approach to the practice of Islam and has adopted many Malay customs and practices. In these communities, women lead more separate lives than men. Women in the orthodox community generally wear the veil on their heads and in a few communities are completely covered except for their eyes. However, in neither community do women appear to participate actively in social or political affairs, instead, they follow the instructions of community religious leaders or their husbands and fathers. The author has not observed any differences between the two communities in terms of the percentage of women who attend schools. This may be due more to external factors (the banning of head scarves by many public schools) than community willingness to educate girls, as discussed below. Like other Cambodians, most Chams live in rural areas, where they are primarily engaged in fishing and farming. Most of them are concentrated along rivers in 6 of Cambodia’s 22 provinces: Kampong Cham, Kampot, Pursat, Battambang, Kandal, and Kampong Chhnang. It is believed that in 1975, when the Khmer Rouge took control of Cambodia, the country’s Cham population was around 700,000. The Chams suffered a devastating loss of people under the Khmer Rouge regime (called Democratic Kampuchea), with an estimated 400,000 to 500,000 dying. Today, about 500,000 Chams live in Cambodia. There is evidence to suggest that the Khmer Rouge persecuted the Cham Muslims on religious and ethnic grounds. Documentation Center of Cambodia scholar Osman Ysa has posited that Chams were killed a rate nearly double to triple that of the general Cambodian population during the Democratic Kampuchea regime (Oukoubah: Justice for the Cham Muslims under Democratic Kampuchea, DC-Cam, 2002). During the period of Khmer Rouge rule (April 1975 – January 1979), Chams were not allowed to worship. Most of the country’s 130 mosques were destroyed or desecrated, and only about 20 of the most prominent Cham clergy in Cambodia survived the regime. Like people throughout Cambodia at the end of Democratic Kampuchea, about three-quarters of the regime’s survivors were women. These widows became the heads of their families and bore most of the responsibility for putting their country back together (it was a policy of the regime to kill educated people; thus, most of the survivors of Democratic Kampuchea could not read or write). Many also suffered from psychological problems and trauma as a result of the loss of family members, hunger, forced labor, imprisonment, and other privations during the regime. Despite women’s crucial role in helping Cambodia to recover, traditional gender inequality subsequently resurfaced in all realms of Cham life, including that of education. This has left a large proportion of Cambodian Muslim women with few literacy skills today. Most of Cambodia’s Muslims do not seem to be aware of the importance of modern education and its role in economic development. Instead, imams, hakim and tuan (community religious leaders), who have a powerful influence on their communities, stress religious education almost exclusively. To make matters worse, scholars seem to have neglected the role of general education and its importance for the Cambodian Muslim community. When other Islamic countries have studied education here, they, too, are largely concerned with religious education. In Cambodia, the percentage of uneducated Muslim people is high, and even most hakim and tuan are illiterate. They don’t have general knowledge and cannot write in Khmer, which is Cambodia’s official language. Because these leaders lack modern education, they address disputes in the traditional way. For example, when a conflict arises between villagers, the imam, hakim and tuan usually resolve it based on their personal experience. But their solutions don’t always employ logic or strategy, and as a result the conflicting parties often do not reconcile effectively. Finding solutions that work requires a wide range of knowledge and experience that include both religious and modern ways. Further, few of the tuan in rural areas who teach Muslim children about the holy Qur-An and Islamic law have an adequate standard of living because they do not have a modern education. If they had more than religious knowledge, they could use their skills to help improve their community’s standard of living, as well as enhance their own lives. Last year, I began working on a project that is recording the oral histories of the Chams during the Khmer Rouge regime. As part of my work, I asked religious leaders and lay people to complete questionnaires on their experiences and views relating to this period of history. I have observed that most villagers, hakim and tuan cannot write well or don’t know how to write. When I asked them why, most complained that they are illiterate and some said that they lack education. Many young Cambodian Muslims recognize that a modern education is vital to their future, but have little to no opportunity to get one beyond high school. So instead, they study Islam and acquire mostly religious knowledge. In answering my questions about studying abroad, they said they had no alternative but to pursue the study of religious subjects. Democratic Kampuchea left in its wake a legacy of illiteracy, and women (both Cham and Buddhist) suffer from higher rates of illiteracy than men to this day. Much of this phenomenon can be attributed to economic and cultural factors. Poverty is a pervasive and self-perpetuating influence on women’s lack of education. Many Cham girls, like their Buddhist counterparts, are unable to complete primary school because they are put in charge of taking care of their younger brothers and sisters at home, doing household chores such as gathering firewood and water, and working on the family farm, especially at harvest time. In addition, such direct expenses for school as fees, clothing and notebooks, as well as the indirect costs of the loss of labor to the household, can be prohibitive for many families. This represents a vicious cycle, wherein poverty forces girls to labor for the family instead of attending school. Without an education, women have little means of earning a living outside the home, reinforcing their impoverishment in the future. Women in conservative Kampong Keh village are studying in a religious class. Cultural factors also have a strong role in preventing many Cham women from completing school. Cham girls begin their religious studies at around the age of six; these classes are taught by a tuan in a girl’s village or one nearby. They are required to wear a headscarf, long blouse and skirt, and to strictly follow codes of Islamic behavior. However, once they enter puberty and prepare to enter secondary school, problems begin. 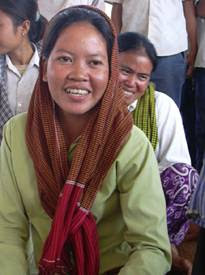 Formal education is not mandatory in Cambodia and in most secondary schools, the wearing of head scarves is not permitted. This policy places both girls and their parents in a dilemma. If the parents insist that the daughter wear a scarf in class, she will be asked to leave school. But if they decide to let the girl remove her scarf, she will be in direct violation of Islamic religious principles and tradition. Thus, many parents elect to have their daughters drop out of school; afterward, the girls often help at home with housework and study religion. The daughters themselves have little say in the matter. The author made several trips to Kampot and Battambang provinces during 2004 and 2005 to learn about some of the problems Cham women face in their communities. In the village of Kampong Keh in Kampot province, for example, interviews were conducted with imam, hakim, tuan, and a group of approximately 35 Muslim men and women around the age of 16. In this orthodox Cham village, where about 250 families live, it is difficult to see Muslim women in secondary school; instead, most dropped out at when their primary education was completed. When asked why this was, I was told that the reason was due to Islamic teaching, norms, and economic necessity. The requirements for girls to cover their heads in both class and public, and Muslim codes of behavior meant that girls could not continue with their schooling. There was little difference in the orthodox village of O-kcheay in Battambang province, where the practice of Islam is very strict. Women there wear a black veil that covers all of their faces except the eyes and long black dresses. There, I interviewed two women who had given birth on the day the Khmer Rouge entered Phnom Penh and began forcing its inhabitants to leave the city: April 17, 1975. The daughter of one of the women, who is now age 30, was nearly completely covered according to the prescriptions of Islamic code. She told me that she dropped out of school at a very young age because of her school’s prohibition on head coverings. In addition, poverty forced her to stay at home. This woman stated that she very much wanted an academic education, but that circumstances had forced her to give up hope of obtaining one. The picture for urban Muslim women is somewhat brighter: they are generally better educated than their rural sisters and many of them work outside the home, largely as a result of economic necessity. But in urban areas, too, “economic necessity” can also mean that a girl must drop out of school and work to support her family. In addition, many parents feel that girls do not need to pursue more than a primary school education; all they need to do is to be able to read and write. And many men feel that their wives’ and daughters’ place is at home, taking care of the children. In both rural and urban poor families, which must often make economic tradeoffs in order to survive economically, the decision is often made to allow the male children to attend school while the daughters stay at home. In addition, men are encouraged and given preference in applying for scholarships to complete their higher educations. This has helped keep literacy rates at low levels for Cham women. Last, the position of women – no matter what their religious background – has not been a matter of concern to the Royal Government of Cambodia. The Cambodian Muslim Students Association conducted a survey on the position of men and women in Cambodia in 2003. Their data show that men play a much more important role than women in the community. For instance, only one woman appears in the list of the country’s seventeen Muslim leaders in the country (Table 1). It is worth noting that today, no Chams have positions of authority in the Ministry of Education (earlier, however, H.E. Tollah was minister of education and he was a Cham). The impact of failing to understand modern education, social needs, the advances of technology, and in particular, the role of women in development, will be to weaken the community deeply in terms of rising violence, illiteracy and poverty. How can Chams find jobs if they have only religious training? How can they develop their community if they have little knowledge of the modern world? And why has the Cambodian Muslim community lagged so far behind its neighbors in Southeast Asia in terms of education, health, and economic infrastructure? Addressing these problems will depend on Muslim themselves, and on advocacy and technical assistance from the national and international communities. The recognition and acceptance of Muslim women’s roles in development and empowering them in the education, economics, social, health and political spheres is the best solution for the Cambodian Muslim community. To develop the country and raise literacy, Cambodia must keep up with global changes by obtaining modern education in addition to religious knowledge. Hakim, imam and tuan should, for example, be educated in management and administration in order to resolve community problems. All Chams should also be encouraged to pursue higher education. And last, Allah said that human beings should have both modern and religious knowledge (Ilmu Dunia and Ilmu Akhirat) in order to live in prosperity. This includes women, who will not be able to advance in society without proper knowledge and education. On behalf of Muslim women, I would like to appeal to both Muslim and non-Muslim countries to grant more scholarships to women so they can obtain general educations. And schools should reconsider their stance on the wearing of head scarves in public schools, which has prevented many Cham women from obtaining an education. These simple actions will give Cambodia’s Muslim women opportunities to play a crucial role in their communities, and help them prosper in the economic, political, social, health, and other arenas. Three other leaders of the Muslim community – H.E. Tollah, H.E. Math Ly, and Sou Zakarya, have died since 2003. All three were men. Unfortunately, there is little to no data available on the literacy rates of the larger Cham community or its women in particular (literacy is self-reported in Cambodia). According to the World Fact Book, the literacy rate for Cambodia as a whole is about 69% (81% for men and 59% for women). It is assumed here that this rate is the same for the subpopulation of Chams. From the author’s personal observations, the literacy rate of Cham women may be as low as 35%. who is the state mufti of cambodia? Heya! I'm at work surfing around your blog from my new iphone 3gs! Just wanted to say I love reading your blog and look forward to all your posts! Carry on the superb work! I think everything composed made a bunch of sense. But, think about this, suppose you were to create a awesome post title? I am not suggesting your content isn't good, but what if you added a post title that grabbed people's attention? at Yahoo's front page and note how they create news headlines to grab people to open the links. You might try adding a video or a pic or two to get readers excited about what you've got to say. Howdy would you mind sharing which blog platform you're using? I'm going to start my own blog soon but I'm having a difficult time choosing between BlogEngine/Wordpress/B2evolution and Drupal. The reason I ask is because your design seems different then most blogs and I'm looking for something completely unique.